It all started in a corner of EMU’s old administration building in 1980. Two employees began tinkering – on their own time − with ways for colleges and universities to manage their administrative affairs with a new technology called computers. The employees – Dwight Wyse ‘68, the school’s director of business affairs, and Mark Shank, director of computer services − cobbled together a company they called Computer Management and Development Services (CMDS). Their first client was EMU; their first employee was Harvey Mast ‘80. CMDS soon moved to a farmhouse on Virginia Avenue, which was eventually torn down to make room for the expansion of Virginia Mennonite Retirement Community (VMRC). In 1983 CMDS moved to a house next to Miller Cabinet Shop at the southwest edge of town and in 1986 to an office building on Virginia Avenue north of VMRC. The company grew to 160 employees, providing software and services to nearly 300 customers in 45 states. CMDS became one of the nation’s leading developers of administrative software for colleges and universities, serving the offices of admissions, registration, alumni, development, financial aid and accounting. Its best-known software was TEAMS. In 1999 CMDS built an imposing corporate office building, designed by architects LeRoy Troyer and Randy Seitz, on Technology Drive off Mt. Clinton Pike near North Main Street (U.S. Route 11). In 2000 CMDS made the momentous decision to be acquired by a new Boston company named Jenzabar. Jenzabar also acquired three of CMDS’s competitors – Campus America of Knoxville, CARS of Cincinnati and Quodata of Hartford. CMDS and two of the other companies maintained their own buildings. After the merger, there was a period of significant employee turnover. A number of the key players in CMDS, including Wyse, left or were laid off. The imposing CMDS building was now too big, and Jenzabar moved its Harrisonburg offices to the headquarters of a former technology firm nearby at 1401 Technology Dr.
Jenzabar supports more than 1,000 campuses in the United States and around the world. Some 20% of all U.S. colleges and universities use Jenzabar software. Among them is EMU. Today, 35 years after the founding of CMDS, Shank and Mast are still with the company. 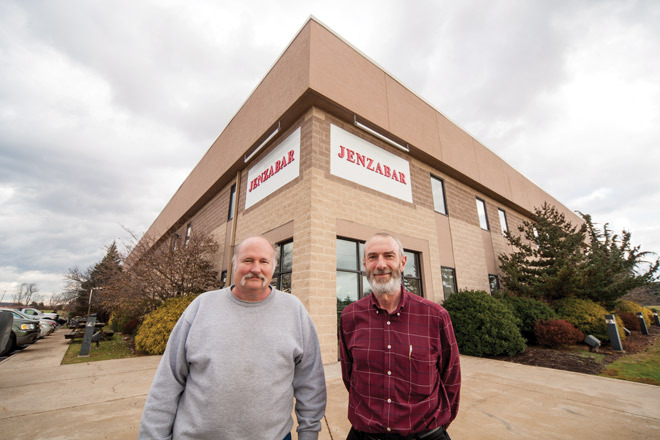 Fifteen EMU alumni work for Jenzabar. About half of them pre-date the merger. One of them, Mark Showalter ’91, joined the day – May 1, 2000 − that the merger was announced. The alumni at Jenzabar, in addition to Mast and Showalter, are: Lois Ann Handrich ’67; Don Bomberger ’72; Dale Hartzler ’85, MDiv. ’08; Brian Boettger ’86, S ’88, ’91; Mike Engle ’87; Mark Deavers ’89; Mike Weaver ’90; Robert Ranck ’90; Dale Hess ’92; Derek Christner ’97; Eric Weaver ’02; Mark Horst ’05; and Jessie Groeneweg ’07.